To those who don't know, at the midnight premiere of the "The Dark Knight Rises" in Aurora, Colorado a gunman opened fire on a packed theater and killed 12 people, wounding another 58. The youngest victim was a four month old child, who as of this posting was still in critical condition at the hospital. A link to the story, for those wanting to catch up. A man walks into a a crowded theater...if this is a joke it's a sick one. James Holmes, age 24, walked into this theater with a gas mask on and opened fire with an AR-15 rifle, a 12-gauge shotgun and at least one of two .40-caliber handguns police recovered at the scene. When apprehended by police Holmes said "I am the Joker". Clearly this is the work of a sick mind, and unfortunately I do very much believe this was meant to be a sick joke on the killer's part. Batman has become much more to people than just a character in a comic book. If the box office grosses serve as a barometer, then super heroes are riding a new high in our culture, largely brought on by the Nolan Batman trilogy. Great passion and high, high emotions are inspired by these films. They mean a great deal to people. This is a testament to their power. In all of the praise it can be forgotten what made Batman, a shooting just like this one. After he which he waged a crusade against crime to avenge their deaths, in the process becoming an idea. Typically the media is very quick to blame violence in Hollywood on atrocities like this, but thus far this really has not been the case. A lot of that has to do with the power of these films, I think. It makes it hard to target a film like this. Does the violence in this film and others like it inspire more people to kill? More and more, the consensus is no. So why did he pick this film? The short answer is that he knew it would be crowded at the event and could kill the most number of people. Unfortunately, there is a fuller more complicated answer. Given his psychological state and statements to police he could have very have selected this movie because it was Batman. Joker?Inspiration is a powerful tool, very powerful. It can be easily twisted into something horrifying. His statement to the police was "I am the Joker". The violence in these films did not inspire him, the character Joker did. You'll hear most everyone say "only a sick mind would respond like that", while true what they are actually doing is trying put distance between themselves and the killer. Boiling the point down it really means "I would never do that". The Joker is powerful like Batman because he himself is an idea, that any person could be like him, that deep down we all have the capacity to be and are monstrosities. Believe me I wish that I could that no one else has this capacity in them but it is all to easy for to picture James Holmes reciting the Joker's monologue from Alan Moore's The Killing Joke into his mirror before committing the act. "All it takes is one bad day to reduce the sanest man alive to lunacy. That's how far the world is from where I am. Just one bad day." I vehemently hate this notion, but to defend against it perhaps we shouldn't dismiss it too quickly. Unfortunately this type of person has just been proven to exist. The sad truth is that the world is not as safe a place as we like to think that it is. Is this the fault of the Batman films? No. They illuminate a part of humanity that has always existed. We could say that if the "The Dark Knight" did provide as captivating a portrayal as the Joker, James Holmes would have been inspired by his madness. But this madness already existed. We don't like to say it but it's there. Though he is a fictional character, the Joker is a very real force in our world. Dark Knights Rising?As bleak as the previous thought is, there is a counter to the force that is joker...and it's called Batman. Batman is the part of humanity that can look into the abyss and when it stares back, won't blink. He is the grit, the determination, the brute force of will that allows us to look fear in the face and punch it. Many lessons should be taken from this, the most important being Batman himself. The world may well be a dark, frightening place...but don't you ever give it the satisfaction of breaking you. Be stronger than fear. Joker may be a very real force in the world but so is Batman. If one lives in us all, then they both do. Which one you let define yourself is up to you. While the adage "people kill people" is true, it is also true that "people with guns kill more people". The responsibility lies with the killer. That said, he would have had a much tougher time had he not had such easy access to this weaponry. 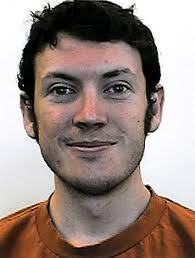 James Holmes bought an assault rifle, a shotgun, two .45 handguns, and over 6000 rounds of ammunition on the internet. Could we make it any easier for him? if he only had access to a knife he still would have done it. I doubt that he could have stabbed over 70 people before being stopped however. If Batman is going to be this big an influence in society then why don't we learn from his story? He is who he is because of gun violence. Is there no way that this opportunity can be used to do something Batman himself would emphatically support, instituting a national assault weapons ban. Keeping it real, radical 2nd Amendment conservatives who blindly back the NRA have some blame in this...more than Hollywood at least. The Supreme Court has ruled that "the right to bear arms" is limited to self defense. Personally I would restrict to those who have served in the military, national guard, or law enforcement but I'm going to go with the court's wider definition for argument's sake. To defend ourselves do we really need assault weapons that are this easily accessible. I do not see a logical reason why the average American needs more than a handgun or a hunting rifle without extensive background checks and multiple permits for each weapon. Perhaps the Brady Bill is done for...if that's the case I'm calling for a Batman Bill that bans assault weapons and heavily regulates firearms in this country. You won't stop the Jokers but you will make it a lot tougher for them. That is the type of thing Batman would fight for. The thing of it is the guy's gun, at least with the modifications, was probably illegal to begin with. Ditto for the tear gas. So it's unlikely any new gun control laws would have anything to do with either. As I've posted before I'm more concerned about any new laws or regulations being pure reaction motivated by politics rather than have any real benefit. Sorry Andrew, your statement is false. He bought all the guns and ammunition legally. I still disagree with your assertion we need to enact more gun control laws. At the very least we need to sit back, let tempers cool and emotion fade so it can be looked at objectively. I'm very pro-gun (though this also includes putting a damned lot of responsibility on the gun owner) you seem to be anti-gun. Fine and understandable. We'll just have to agree to disagree.